I think radishes are beautiful.The pop of color pushing out of the ground? Always makes me smile. And here in Minnesota, radishes are exciting because they’re generally one of the first vegetables we get to harvest. But I never liked to eat radishes until someone suggested to me that I should fry them. Fried radishes. Can you even do that? …and give them a good bath. Next, cut them into thin slices, as you would if you were frying potatoes. Heat up your skillet on medium (I love my cast iron skillet – just like this one!) and toss in a bit of your favorite oil/fat/lard. In this particular instance, I used 2 tablespoons of oil for about 5 cups of sliced radishes. When both the pan and oil are hot, toss in your sliced radishes. Stir them around. Experiment with seasoning. I like freshly ground black pepper and some garlic salt. You could also toss in some onion or diced peppers, or any other of your favorite veggies. If you have a cover for your skillet, use it – it will cut down the cooking time. I stir the radishes around every 5-7 minutes or so. I like my radishes fried until they’re getting towards that caramelized-ish state, which takes a good half hour on medium heat. Slap those fried radishes on your plate. Side note: Doesn’t it look like a plate of curly bacon? Fried radishes are much more mild than their raw counterparts. I’m glad I’ve found a way to enjoy these gorgeous, colorful veggies. You should definitely give them a try! I just wandered in from the Homestead Blogger Network and it was nice to see a fellow Minnesotan (we’re in SW MN). Off to go explore now! Alicia! run The Hmmmschooling Mom, too! I KNOW YOU! 🙂 Thanks for stopping by. 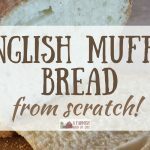 I’m going to have to try this – sounds delicious! Everthing is better fried. I can’t wait to try this! I wasn’t a big fan of radishes for the longest time, but I’ve grown them for years as a trap crop to deter flea beetles from my squashes and cucumbers. Well I decided this year that since radishes are so darn easy to grow, and they mature so quickly, it was foolish to not eat them too. I still don’t care too much to just snack on a radish raw, but I have grown accustomed to having them in a salad, and we tried them oven-roasted (they were like a watery turnip and not hot at all).. 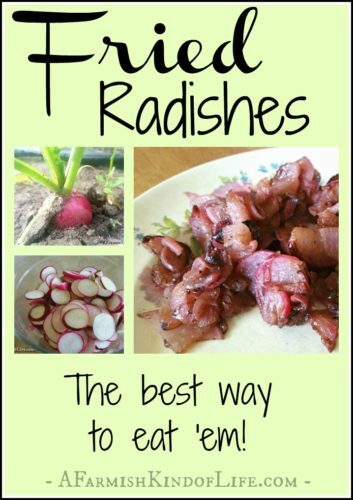 This will be the next way we try eating radishes! Thanks for sharing!! !